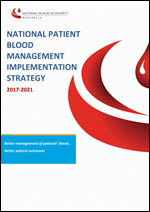 The National Patient Blood Management Implementation Strategy 2017-2021 takes a patient-centred approach intended to optimise clinical outcomes and improve patient safety. This Strategy draws on the experiences and outcomes of the National Patient Blood Management Guidelines Implementation Strategy 2013-2017 and the National Blood Sector Education and Training Strategy 2013-2016. Since the launch of the PBM Guidelines and accompanying implementation strategy, Australia has seen a significant reduction in the use of red blood cells. The implementation of the Standard (a dedicated hospital accreditation standard for Blood and Blood Products and the revised Blood Management Standard) has also contributed to this decline in the use of red blood cells. The PBM activities to be undertaken are categorised to reflect these new elements in line with the revised goals and objectives. Audits: spreadsheets to be adapted for local data collection. Patient Blood Management Resource Guide (October 2018) To support the implementation of the PBM guidelines the NBA has produced the Patient Blood Management Resource Guide which lists the materials available at a National level to support implementation at a health provider level. The guide also includes some references to education and training. The Patient Blood Management Guidelines: Companions provide supporting information aimed at improving knowledge and understanding of the guidelines and how they can be used to achieve better patient care and outcomes. If transfusion is clinically indicated, details of risks and benefits to support this process are also outlined in this document. Single Unit Transfusion Guide has been designed with the intention that they can easily be adapted to accommodate the local policies and practice of individual hospitals. They are available as generic baseline material to download, alter, and adapt as applicable to their local requirements. Guidance for the Provision of Intraoperative Cell Salvage is intended to inform health-care practitioners, health educators, health service managers and policy makers about Intraoperative Cell Salvage use for patients undergoing surgery or invasive procedures, particularly those in which blood loss is anticipated. It is aimed at supporting hospitals to develop and implement an intraoperative cell salvage program. The Iron product choice and dose calculation guide for adults has been developed to assist clinicians determine the appropriate formulation and dosage of iron replacement therapy for adult patients. 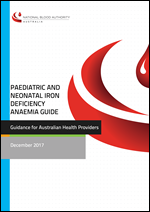 This Paediatric and Neonatal Iron Deficiency Anaemia guide has been developed to assist clinicians determine the appropriate formulation and dosage for addressing Paediatric and Neonatal Iron Deficiency Anaemia (IDA). Fit For Surgery: Managing Iron Deficiency Anaemia. Resources for general practitioners managing patients undergoing planned surgery. NPS MedicineWise and the National Blood Authority have collaborated to develop a suite of resources to assist you in helping your patients get fit for surgery. Lanyard Cards (Acute Transfusion Reactions Card/Blood Prescribing Card/Warfarin Reversal Card) - bedside resources to assist with blood component prescription, acute transfusion reaction management and warfarin reversal. The Preoperative Anaemia Case Study is intended to inform healthcare practitioners, health educators, health service managers and policy makers about preoperative anaemia screening. This resource provides a wealth of ideas and links to help hospitals use clinical practice improvement methods to implement an anaemia screening based on evidence-based recommendations in the Patient Blood Management Guidelines: Module 2: Perioperative. Point of Care Coagulation Testing Case Study​: this case study illustrates an example of a hospital that has implemented a Bleeding Management Treatment Protocol supported by Point of Care Coagulation Testing (POCCT) to detect, manage and monitor critical bleeding in cardiac surgery patients. 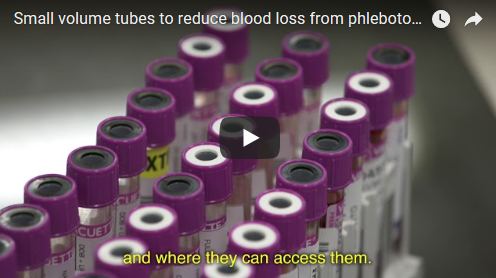 Small volume tubes at Flinders Medical Centre, SA: Hospital acquired anaemia or iatrogenic anaemia is anaemia that results from blood loss due to repeated blood sample collection (phlebotomy), of hospitalised patients for the purpose of diagnostic testing. This case study illustrates the implementation of the introduction of small volume sample tubes at the Flinders Medical Centre intensive care unit, which significantly reduced iatrogenic blood loss due to diagnostic testing without adversely affecting the laboratory workflow. Visit the Use of small volume tubes to reduce blood loss Case Study to see how this project was implemented. The Massive Transfusion Protocol Clinical Audit Tool is a standards based audit that can assist in identifying gaps and measuring activity related to Massive Transfusion in a continuous quality cycle. The purpose of the Massive Transfusion Protocol Audit is to provide a framework for facilities to develop a knowledge base of current activities, enabling an evidence base to inform any improvements. The Red Blood Cell Clinical Audit Tool is a standards based audit and can be useful for measuring current practice against best available evidence, in a continuous quality cycle. The purpose of the Red Blood Cell Clinical Audit Tool is to improve patient outcomes by collecting data that can be used to support the audit and monitoring requirements for the organisation. Blood, Still Saving Lives video: this video highlights the benefits and risks of red blood cell transfusions. Case Studies: The National Blood Authority (NBA) is currently working on a range of activities to support hospital and pathology services to fully implement the National Safety and Quality Standard for Blood and Blood Products. One of the ways in which this is being achieved is to identify areas of best practice already in existence across the country, record and document these practices for others to view and further develop in their own workplace. Relevant techniques, tools and approaches undertaken by various providers will be published below as they become available so other centres across Australia can adopt and modify practices to suit their own conditions. Patient Blood Management Guidelines Preoperative Haemoglobin Assessment and Optimisation Template: this template is for patients undergoing procedures in which substantial blood loss is anticipated such as cardiac surgery, major orthopaedic, vascular and general surgery. Massive Transfusion Protocol (MTP) template: broadly covers areas that should be included in a local MTP. This template can be used to develop an MTP to meet the needs of the local institution’s patient population and resources. The Australian & New Zealand Society of Blood Transfusion (ANZSBT) comprises members from diverse scientific, technical and medical backgrounds working within the areas of Blood Transfusion and Transfusion Medicine within Australia and New Zealand. BloodSafe e Learning Australia is jointly funded by all Australian Governments. The eLearning courses on this site have been developed for health professionals, including medical, nursing and midwifery, as well as students to improve the participant’s knowledge of safe clinical transfusion practice and effective patient blood management. The Standardised Iron Reporting Protocol contains recommendations and guidelines for pathologists and pathology laboratories for the preparation of structured reports for iron studies. Structured reporting aims to improve the completeness and usability of pathology reports for clinicians, and improve decision support for patient management. 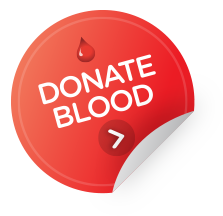 transfusion.com.au is the Australian Red Cross Blood Service website for health professionals. It provides information about blood products and components to assist with best practice in laboratories, in surgery and at the bedside. The site is also the gateway to the online learning, registration for webinars, and tools and resources to improve transfusion practice and knowledge. Joint United Kingdom (UK) Blood Transfusion and Tissue Transplantation Services Professional Advisory Committee (JPAC UK) The UK Blood Transfusion Services web site is owned and maintained by the Joint UKBTS Joint Professional Advisory Committee (JPAC). Network for the Advancement of Patient Blood Management, Haemostasis and Thrombosis (NATA) provides a multidisciplinary forum for dialogue between haematologists, blood bankers, anaesthesiologists, surgeons and other healthcare professionals interested in promoting best clinical practice in the fields of patient blood management, haemostasis and thrombosis. ‘Transfusion Strategies for Acute Upper Gastrointestinal Bleeding’ by Villanueva et al. (2013) is a study that compared the efficacy and safety of a restrictive transfusion strategy with those of a liberal transfusion strategy in patients with upper GI bleeds. Lower mortality was noted in the restrictive transfusion group. NICE guidance for Acute Upper Gastrointestinal Bleeding: Evidence Update is a summary of selected new evidence relevant to NICE clinical guidelines 141 ‘Acute upper gastrointestinal bleeding: management’. Section 1.2 demonstrates the recommendation of basing decisions on blood transfusion on the full clinical picture, and recognising that over-transfusion may be as damaging as under-transfusion. The Gauss Surgical app uses an iPad camera to scan surgical gauze covered in blood. The app provides an estimate of how much blood has been collected in the sponge. This is helpful to the OR staff in deciding if, or when, to start a blood transfusion. Sunshine Coast Hospital and Health Service have developed a Blood Transfusion Checklist, Traffic Guideline and Plasma Request forms that are available to download and adapt to your hospital or practice. 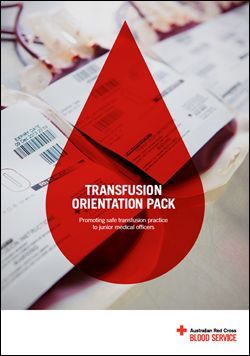 Grafton Base Hospital have developed a Red Cell Transfusion Pack that is available to view as an example of which forms a doctor can include when their patient requires a red cell transfusion. Haemochromatosis Australia is a non-profit registered charity run entirely by volunteers. They are the support and advocacy group for people affected by haemochromatosis, their families and loved ones. They aim to provide support for people with the disorder and to increase awareness of haemochromatosis in the general public and the medical and health professions. Want more information on PBM? State or territory health departments have numerous high quality tools and resources for implementation of patient blood management initiatives and wastage reduction strategies.